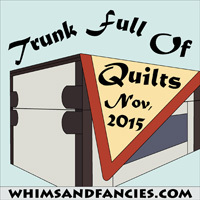 This is the quilt that generated most of the leftover units for my previous blog. I called it "Geisha Surrounded". I know, I couldn't help myself. You can just see the geisha with her fan peeking from the edge of the circle. I won the border blocks in a block of the month drawing at my guild. Of course a certain amount of variation is expected in any block swap but since these Bergoine Surrounded blocks had sooo many seams the discrepancy was somewhat amplified. The blocks were suppose to be 14" finished but they measured from about 13 1/4" to about 15 1/4". Also some people did not make them a 'variety' of Amish colors, so I tabled a couple of them. But I thought rather than set the blocks in a regular grid where the measurement differences would be really obvious I would use them to make a border. I designed the center to accommodate the border. You can still see where the corners of the blocks meet how much had to be trimmed off to make them all the same size. The next time you find yourself with some 'dimension' challenged BOMs you might try this approach. It's fun and relatively easy. Cheers, Claire W.
You clever lady! This quilt is lovely and dramatic and inspired. Using the various sized blocks as the border makes perfect sense. It's one of those "Why didn't I think of that?" solutions. Thank you for your kind comments on my last two posts. I would have replied directly to you, but you're still set as a "no reply blogger."